Designed by Robert A.M. Stern Architects, one of the nation’s premier firms, 1331 represents a new benchmark in residential communities. Every light-filled home features premium finishes and magnificent views of the city, its iconic monuments and the Potomac — all with the services and amenities of a world-class hotel and central location lets you easily connect with the District’s most desirable and vital destinations. 1331 is the living opportunity that’s finally arrived. It’s a lifestyle made possible by a new paradigm — elegant modern residences where service, ease and access share the same address. Inspired by the District's grand residential buildings of the 1920s and '30s, 1331 Maryland brings DC's Modern Classicism into the 21st century. 1331's facades, designed by Robert A.M. Stern Architects, echo the stately aesthetics of the Federal buildings along 14th Street; the artful arrangement of balconies, terraces, and setbacks bring a modern residential vitality to the design. Prominently sited where the 14th Street Bridge enters the District, but entered via a secluded cul-de-sac at the end of Maryland Avenue, 1331 possesses both a monumental quality and a warm, welcoming residential character. 1331’s Maryland Avenue entrance features a magnificent double-height glass portal with honed Fior di Bosco marble. Within, a sculptural satin-finished brass chandelier animates the lobby, while the room’s 15-foot ceiling height lends the space a stately grandeur. Six massive, fluted stained-oak columns, complemented by a Zebrino marble herringbone-patterned floor, create a sophisticated white and grey palette. A grand stairwell with slender metal railings and an oval wall clad with a butterfly mosaic, leads to the resident fitness center. Thoughtfully arranged seating and soft warm lighting offer an atmosphere that’s comfortable and welcoming. Robert A.M. Stern Architects is known for designing buildings that capture the spirit of the places in which they build – they are portrait artists, adapting the principles of Classicism to modern needs and technologies. This approach has enabled the firm to create record-setting residential buildings for its clients, bringing new vitality to timetested forms. The firm's founder Robert A.M. Stern and his Partners Paul L. Whalen and Sargent C. Gardiner have dedicated their careers to understanding how people want to live in cities. 1331 is yet another example of Robert A.M. Stern Architects' ability to deliver a fresh, contemporary building that reflects the heritage and advantages of its location. 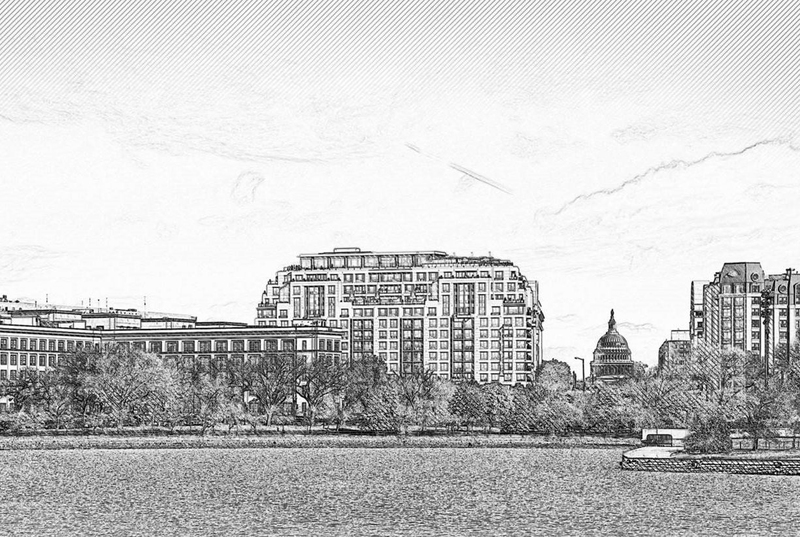 1331 is conceived to exceed expectations, and enables a lifestyle that is unattainable at any other residence in D.C. The amenities and services at 1331 surround residents with opportunities to enjoy a rich recreational and social life without ever leaving the building. From al fresco dining on the roof with panoramic views to quiet time in the library with the latest best sellers to the full service, around the clock concierge to exclusive access to the Mandarin Oriental hotel, the services and amenities are designed to deliver an effortless living experience. Curated to enhance every aspect of life, there’s an amenity for any occasion and everyone. Located on the rooftop and overlooking the Tidal Basin, swimmers feel as though they’re floating above the surrounding landscape. A curated book selection, with comfortable seating and task lighting, featuring a gas fireplace. Rooftop indoor lounge with dining room, living room, seating area, and demonstration catering kitchen and panoramic views. Fully equipped with the latest technology including Peloton Bikes and towel service plus an adjoining Studio Room for custom fitness classes and yoga with 86-inch monitor for Fitness On Demand classes. Rooftop indoor club room with separate bar area and private events room with breathtaking views of DC and VA, complete with retractable glass walls for seasonal outdoor access. A fully-fitted grooming station and dog run for keeping pets clean and healthy. 1331 offers an all-encompassing amenities experience with a curated selection providing residents options for socializing, wellbeing and exercising. The level of service at 1331 are similar to a world-class hotel. Every need has been anticipated, beginning before a resident moves in with the Move-In Concierge to Away-From-Home Services assisting with pet or plant care while they are out of town to on site event planning. The menu of options even extends beyond the building itself, through exclusive partnerships. Residents of 1331 enjoy access to the five-star Mandarin Oriental’s spa, fitness center and restaurants, as well as catering and events. Those on the Penthouse Level receive elevated access to the Mandarin and an additional selection of personalized services to create all-encompassing services experience. 1331 is a prize location. It’s adjacent to the National Mall and the Wharf. It sits by the Tidal Basin, just minutes from National Landing and Reagan National Airport. The commute to downtown is about as easy as it gets. A taxi to Union Station is ten minutes. Immediate access to 395 and the 14th Street Bridge offers a head start to Virginia commutes or weekend escapes from the city. No matter what your appetites, dining in D.C. offers a menu of world-class choices, from classic French to artisanal farm-to-table. The art and performance venues in Washington D.C. rank among the best in the nation. An easy walk from 1331, the museums of the National Mall satisfy any and every interest. 1331 is strategically located, making coming or going by planes, trains or automobiles, quick and easy. With close proximity to Union Station, Reagan National airport, and immediate access to the beltways connecting to Virginia and Maryland, commuting is as hassle free as it gets.